TILT is bringing you Weeping Mary's Ghost Pepper Peanuts this week. 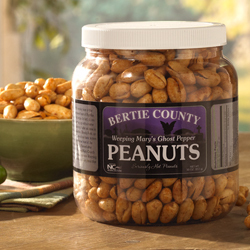 These are from Bertie County Peanuts in Windsor, NC. I have tried the Salt and Pepper peanuts which were amazingly delicious. I'm anxious to try the Ghost Pepper peanuts because I love hot. I'm thinking about getting some as a gift for a friend who loves foods that everyone else deems to hot to eat. They have tons of flavors to choose from and I think a variety pack is in order. NC hosts several festivals and events that are all about NC made foods and they're a great place to try foods that are local or almost local. I don't remember as many festivals when I lived in Virginia but it doesn't mean they weren't there :). You should look around locally and see what great festivals you have!